SUP surfing, stand up paddle boarding, sea sweeping; whatever you call riding waves on a SUP board with a paddle in your hands, it’s a dead certain that it’s almost too much fun. Tiny ripples or booming overhead SUP surfing is one of the most fun ocean activities ever. Here’s a guide to getting your first waves safely and stylishly. Compared to flat water paddling, SUP surfing takes place in a more demanding and dynamic environment. With regard to both water movement and the behaviour of other water users, you need to take this into account. For safety and to ensure a good time it’s advisable to have your basic skills well pinned down before getting stuck in. You’re going to need a good, effective paddle stroke and be able to use a variety of strokes with confidence. In sheltered flat water and ideally also in more exposed conditions your balance should be well honed and you’ll need the ability to move your feet from a parallel paddle stance to the classic surfing stance with one foot leading and the other back towards the tail. Being able to complete a pivot turn in both directions (clockwise and counter clockwise rotations) will come in very handy manoeuvring your board in the surf and also help when we actually start to ride waves, as the movement patterns are very similar to some used whilst surfing. If you’re not confident that your SUP skills are up to scratch don’t rush it; take a little more time getting prepared for your first SUP surfing sessions – it’ll stand you in good stead in the long run. Ok so we’re up to speed skills-wise but we’re not sure what sort of equipment will work best for us. What shape and size of board? How long should the paddle be? What other specialist kit will I need? Pro Wave or Surf: Shorter, lower volume boards that resemble enlarged, regular shortboard surfboards. These are often available in 100% carbon constructions as well as regular epoxy builds. Their design is primarily about performance on the wave face, which leads to a definite reduction in stability and paddle efficiency. Unless you are very light (50kg), have years of open water SUP experience or are a professional level surfer/windsurfer/kitesurfer etc then in all probability these types of board will be extremely frustrating and won’t facilitate progression at this stage of your SUP surfing journey. 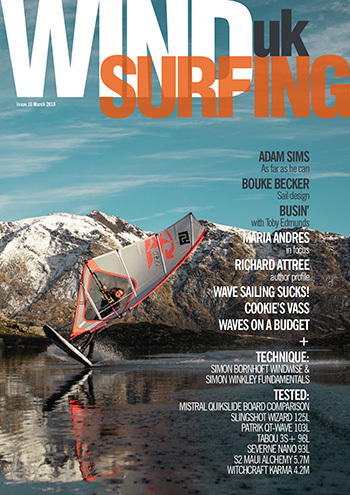 All Wave or Surf: Wider surf dedicated shapes that are often offered in both regular and premium constructions. All Wave boards will be notably more stable than the skinnier Pro Wave ranges and are easier to paddle and catch waves on. 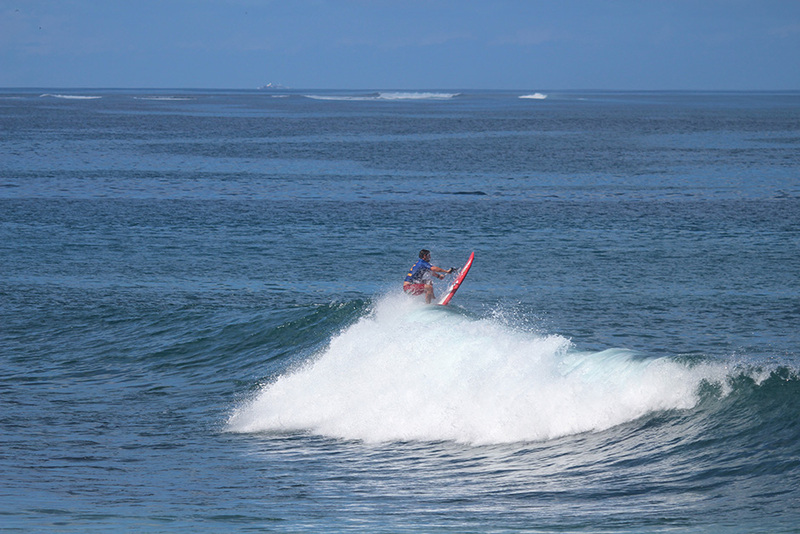 They also provide the rider with the possibility of an impressive level of surfing. Experienced SUP surfers will often enjoy the lower volume versions of these full template boards in smaller, weaker surf. If you have some surf sports experience and are relatively confident then a longer, higher volume All Wave type of SUP can be a good choice as a first board. 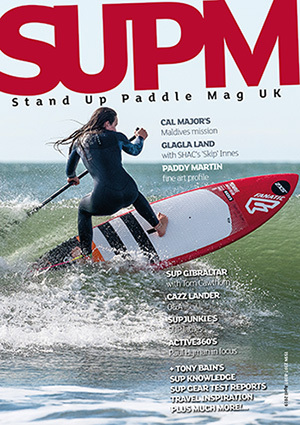 All round: All round SUP boards are the most popular choice for the great majority of SUP paddlers in the UK. With a similar ‘lollipop stick’ shape to a surfing longboard, parallel rails and a round nose, this style of board will have more volume and length than the surf specific models. This results in much more comfortable flat water paddling, a nice level of stability and lovely ‘gliding’ surfing in smaller waves. Being available in all constructions, you will find all round SUP boards under the feet of both beginner SUP surfers and experienced riders who prefer a style of riding more akin to longboard surfing than the cut and thrust of the shortboard influenced Pro and All Wave models. The higher volume and longer, straighter templates also work well on flat water. All round SUP boards give great value, work in varied conditions and are often the ‘go to’ board for riders getting into SUP surf. Note that there are many fantastic inflatable versions available. Whilst they will surf just fine in small, gentle conditions, they won’t give the performance that rigid constructions do in bigger or more challenging surf. Over the last couple of years paddle lengths have dropped and nowhere is this more evident than in SUP surfing. Whilst flat water paddles are hovering at 6-8 inches above height, surf paddles are trending at around height. This allows for an easier paddle switch whilst in the compressed surfing stance and more comfortable paddling in the surf zone and line up. A good idea is to have a few try out paddles with an adjustable shaft before settling on a length that suits you. Blade size is important too. 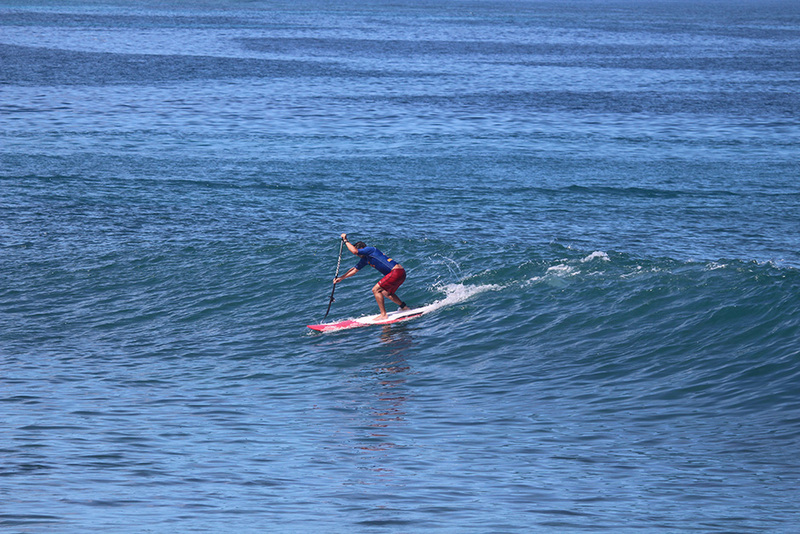 Many dedicated SUP surfers like a lower area, narrower blade. This allows a higher cadence and helps with the sometimes arrhythmic nature of surf paddling. You’ll feel as if you’ve dropped a gear or two if you’re used to longer, higher blade area paddles. A great analogy is the difference between bodyboard and diving fins. 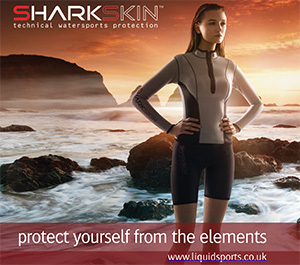 Small bladed bodyboarding fins allow quick acceleration and high manoeuvrability whilst a diving fin is better suited to maintaining pace over an extended time. Your paddle is instrumental in control, turning and recovery when riding the wave, a whole new area of use. We’ll take a closer look at how to use your paddle whilst surfing later on but again a shorter paddle helps by putting the rider closer to the water through turns and allowing a greater range of movement. I was given a great piece of advice by John Hibbard years ago when I was just getting into SUP: ‘Buy the best paddle you can afford’. To this day I value this little gem and I’d like to pass it on to those of you reading this now. A high end carbon or carbon composite construction is lighter, has better flex and so will be less tiring and easier on your body during long sessions. A vital piece of equipment. Under NO circumstances should you enter a surf zone without a leash. Most SUP surfers prefer to use a heavy gauge (I snapped more leashes in 1 year of SUP surfing than 30 years of surfing) leash around 8mm thick and about the same length as the board they’re riding. Therefore for an 8.4ft Pro Wave an 8ft or 9ft long x 8mm thick leash would be fine. On the longer all round boards you will also see knee (as opposed to ankle) leashes being used – a matter of personal preference. Personal Flotation Devices. In big waves or remote locations a PFD can give you a confidence boost and very possibly save your life if things go very astray. Initially you shouldn’t be in conditions that necessitate their use and they can become a hindrance to passing through or under waves if you’re in the drink. If you’re sufficiently unsure about your safety to feel you need a PFD then more preparation is needed. You are attached to your board, the best flotation aid ever. You should be able to swim out of any eventuality during any given session. Not commonly employed but not a bad idea at all. SUP surfing involves a lot of heavy, potentially hazardous kit and a bang on the head isn’t conducive to successful, fun SUPing. Worth a thought. Suited and booted with board, paddle and leash. This is where the game becomes real and we need to start thinking and acting like a responsible SUP surfer. Assessing conditions and picking the best waves for your level: An ideal location would be a wide, open, flat, sandy beach without rocks, jetties or any other major obstacles. The best surf is small, gentle waves up to 3ft high, breaking over a sand bottom. Ideally the waves should be forming some distance from the shoreline and breaking in either one or both (left and right) directions, parallel to the beach. The wind is an important consideration too. Light offshore winds or no wind at all are the most favourable as the water surface remains smooth and we can concentrate on perfecting skills in place of just trying to stay on the board. Brisk, onshore winds create chop, tear up the surf and make things exponentially more challenging. Even very experienced SUP surfers will avoid surfing in overly bumpy conditions. We should also consider other people in the water. If the surf is crowded then it’s always advisable to look for a quieter part of the beach. In summer, many popular surf beaches have extensive bathing areas, high concentrations of beginner surfers and surf schools; again use common sense and pick an area of the beach that will minimise the risk to others and yourself. Locations that have traditionally strong surfing populations, such as Fistral, St Agnes, Croyde, Llangland etc, should be avoided until your skills are very well developed. If you are uncertain as to where to surf then ask someone more familiar with the beach or the RNLI lifeguards if they are on duty. 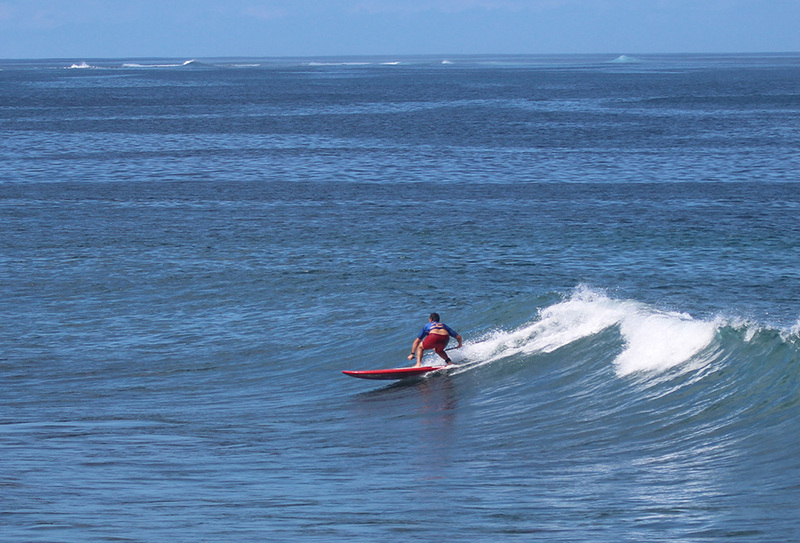 Getting out through the surf and into the lineup is the first big test for the new SUP surfer. Firstly we will need to maintain the nose of the board pointing out to sea at approximately 90° to the predominate surf line. Push your board out into the shallows until your fin won’t hit the bottom when you stand on the board. You can secure your paddle by placing it under your hand on the opposite of the board to that which you will mount the board from. After a white water wave passes under the board, mount it and get to your feet straight away. Paddle hard, directly at the oncoming waves, trying to avoid actual breaking waves. You will find that you will pass over smaller foam waves without much trouble. As they approach keep looking forward, flex your knees and let the board climb over the wave. Don’t try to paddle up the wave but as soon as the nose of your board starts to punch out the back of the wave then set your paddle in the top of the wave just behind the foam (the blade has no purchase in the aerated water). As you progress, the wave height will increase; however, after some practice, you’ll be surprised at what you can negotiate. For these slightly bigger waves we often take a step with our back leg (surfing stance) into an intermediate position between parallel paddle and surf stances. This will give you more longitudinal stability as the nose rises and falls. You can even weight a little on your back foot as the wave front hits you to help the board ride over it. Again get that paddle in the top of the wave. Be warned that it’s not uncommon for the board to be flicked towards you going over larger waves, so be prepared for this and try to ensure your paddle isn’t between you and your board. I’ve had a couple of bashes in the chops from mangling this one! Once you get out past the last line of white water you can then zig zag out, paddling over the shoulder of incoming waves. Again I like to employ a split stance going over unbroken waves. It’s best to avoid the steepest, breaking part of the wave – not just for safety and easy paddling but because this is where surfers, bodyboarders and other SUP surfers will be riding, so try to give them plenty of space and remember that the rider has priority. We’ll deal with rules and etiquette shortly. Once you are clear of breaking waves, position yourself facing out to sea just a little further out from where most of the waves are breaking. Try to stay well away from other water users until you are very comfortable with the surf and having traffic around you. Note, getting caught inside. Caught inside means being too close to shore when a larger wave comes so that it breaks in front of or even on you. You probably won’t be able to paddle over the wave, so you’re going to have to bail. LOOK AROUND YOU FIRST. If the area surrounding you (how long is your board? how long is your leash? BE AWARE) is clear, then slip off to the side and duck under the wave as it comes, take the hit and recover your board afterwards. If the area around you isn’t clear, your responsibility is to remove the risk. You can either duck under the wave whilst holding onto the rail saver (the fabric part of the leash closest to the board) or turn your board to shore and belly ride it out of the impact zone into safety. Employing the first method will only work in very small waves and you run the risk of injuring yourself. I’m a fan of the belly ride out method. Negotiating the lineup: This is where the other surfers are waiting for waves and is governed by priority and traffic rules that pretty much stand up worldwide. You will also encounter local hierarchies and pecking orders that need to be respected. Again we’ll take a closer look shortly. Place yourself away from any large groups of surfers and try to find a peak, the triangle shape as a wave rears up just prior to breaking. A good trick to locate the peak is to look at the triangles of white aerated water on the surface left over from waves that have just broken. This will also help you identify if the waves are breaking to the left, right or both directions. You will encounter closeouts too – waves that break all along their length at the same time. Too many close outs and your session won’t be fun! Once you have found a peak, wait just to one side for a wave. Note that paddling straight to the top of the waiting surfers is very bad manners and will land you in trouble straight away, so wait your turn and try to pick off a wave that doesn’t have anyone else going for it. Priority is with the surfer deepest in the peak or closest to the breaking part of the wave. DO NOT paddle for waves that someone is already riding; this is called dropping in and will not be accepted. Wait for a wave that you feel confident to catch, bearing in mind that you may need to be mobile to position yourself to catch the wave as it steepens. The best SUP surfers are always hunting waves down but do so with respect and awareness of the others in the water. So there’s a wave approaching you, nobody in the way and no one paddling for it. You’re still facing out to sea and now need to start paddling. Let’s suppose that the wave is a left (breaking to the left from the rider’s perspective) and you are positioned in front of the wall of the oncoming wave, with the breaking part to your left as you face out to sea. In the parallel stance, paddle on your right rail towards the peak, allowing the board to prescribe an arc counter-clockwise. When you are parallel to the wave, step back into your surf stance. This is important as it allows you to brace as the wave rises under you and the nose of the board drops (if you remain in the parallel stance you may well fall backwards). Keep an eye on the wave and on the area directly in front of you and using short, rapid stokes try to have the board pointing directly to the shore and down the wave as it reaches you. You will feel the tail of the board rise and a sudden burst of acceleration as the wave face becomes more vertical and gravity causes the board to start to drop down the wave. Compress your stance, look where you are going and enjoy the ride. You are SUP surfing! A left to right mirror of the above works for rights. You can also start from a position closer to the breaking part of the wave and draw an arc in the direction of the wall of the wave, indeed you may have to as you react to the wave’s movement, however most of us find it easier to employ the method described above. As your positioning, timing and wave knowledge improve, you will find that the arcs you paddle into waves become tighter until eventually you will use very few strokes and possibly even pivot turns to get in the spot. Note that on steeper or faster breaking waves you may need to step back with both feet to avoid nose diving. Initially you shouldn’t be in surf that needs it but we should have the concept of moving around the board freely whilst surfing because we are going to need it a lot later on. Surf etiquette and rules of priority are long standing and internationally recognised. The good news is that if you adhere to them and don’t be a SUP donkey (there are plenty of these, we don’t need more!) then you will have fun in the water without problems. The bad news is that if you infringe them and become a pest – or worse, a danger to others – then your SUP surfing experience will probably end badly. SUP surfboards and paddles are inherently quicker through the water, catch waves much earlier and are potentially much more hazardous than regular surfboards, so the following need not only to be taken seriously but not pushed to the limit either. A light touch will go down well. Don’t paddle to the top of the line up. There will be an existing and slightly fluid pecking order at all popular beaches. Take your time, start a little down from the top dogs holding prime position and slowly work your way to where the primo waves are breaking. Let everyone get used to your presence. The surfer deepest in the peak of the wave or closest to the breaking part of the wave has right of way. This doesn’t mean that you can spin around at the last moment inside someone who has clearly been waiting. This is called snaking and isn’t well received. Dropping in is to deliberately take off on a wave already being ridden or when someone else has clear right of way. DO NOT DROP IN. Rider has priority. This means that if you are in front of a wave that is being ridden and by trying to paddle over the shoulder of the wave you would impede the surfers ride, then you paddle towards the whitewater and take the hit. Secondly when paddling back out to the line up in clear water, try to give the waves being ridden plenty of clearance by paddling wide. As mentioned earlier, don’t ditch your board where it could cause harm to others. This is the great failing of SUP surfers. Catching every wave that you can, taking lots of waves from further out and generally abusing the extra speed and wave catching qualities of SUP surfboards is very tempting but will test already strained surfer – SUP relationships. Relax, take a rest now and then and watch other people enjoying their surf session before catching another wave. Respect others, respect the beach and respect your level of experience and ability. Be aware of what’s going on around you, the vibe in the water and any changes in the conditions or crowd. Always minimise the risk. It’s just a wave and there will always be another, so if there’s any doubt don’t go. Always assist someone in difficulty.